This all-in-one kit is a necessity for any environmental science classroom or lab. It includes an AquaShock Dissolved Oxygen (DO) Meter; ATC DO probe, AC adaptor, manual, warranty card, and probe input covers – all in a foam-lined, hard-shell carrying case. 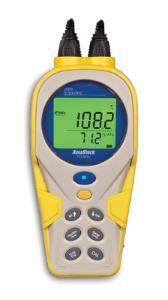 Measures DO in either % saturation, ppm, or mg/L and accepts corrections for salinity and barometric pressure. Set-up is quick and easy with auto-calibration to air and recall of slope and last calibration. Specifications: Range: 0.00-19.99 mg/L (ppm); 0.0-199.9% saturation; temperature 32-122 °F / 0-50 °C; Resolution: 0.01 mg/L (ppm); 0.1% saturation; temperature 0.1 °F or 0.1 °C; Accuracy: +/- 1% full scale; +/- 1% saturation full scale; temperature +/- 0.9 °F or 0.5 °C. Size: 8 1/4 × 4 1/4 × 2 1/4"; weight: 1 lb.